Florida summers are sweltering so sipping a tall glass of refreshing iced tea is the perfect way for my family to cool off on those hot days. I have been a fan of Mighty Leaf teas for two years because these artisan teas never sacrifice quality and make a superior iced tea brew. 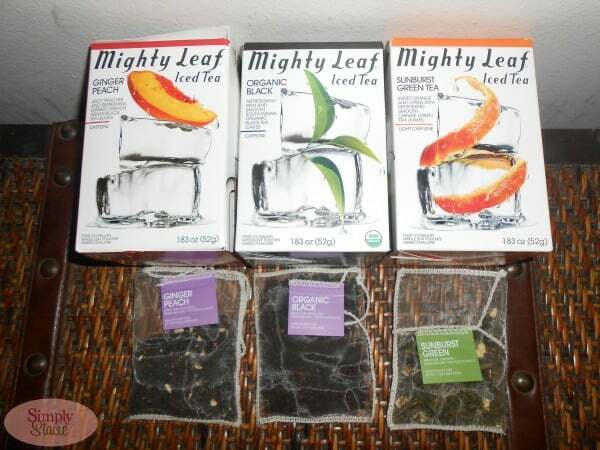 Mighty Leaf uses whole leaf pouches with hand crafted blended to ensure that every glass of tea is absolutely perfect and has full bodied taste. There are a wide variety of tea blends to choose from including a few of our favorites such as Ginger Peach, Organic Black, Sunburst Green Tea and Calypso Mango. Each box contains 4 tea pouches to make a total of 2 gallons of iced tea. I use a half gallon pitcher and add 1 tea pouch. Instructions call for adding 32 ounces of boiling water into the glass pitcher but it is so hot in Florida that I prefer to sun brew and it always turns out perfectly. The Ginger Peach Iced Tea ($6.25 box) has a ripe peach fruit taste with zingy ginger blended into Indian Black Tea for an exceptional summer iced tea. This infusion is lightly sweet naturally so that I don’t even have to add my normal packed of stevia. I love that Mighty Leaf offers an iced green tea and the Sunburst Green Tea is delicious. It is made using sweet orange and citrus blends with mountain grown Chinese green tea leaves. I appreciate that this tea has a wonderful distinctive taste yet there is no bitterness at all…..just a delightful, powerful green tea taste. My preference is always to choose organic when it is an option so I really enjoyed trying the Organic Black Tea made with South Indian organic black tea leaves. This makes the perfect Southern Sweet Tea when blended with your favorite sweetener (we use stevia) and a squeeze of fresh lemon. My children like this as a cool treat blended with a hint of cream, a swirl of honey and a dash of cinnamon……delicious! My husband is a big fan of the Calypso Mango because he really likes that you can taste the mango fruit taste in this blend of South Indian Black tea leaves. It has a really nice aromatic smell that was a hit when served at a recently family barbecue. I recently discovered a few new accessories that make drinking our iced tea and water even better including the Takeya’s Classic Water Bottle (SRP $19.99) which is a premium recycled water bottle that has a wide mouth and is protected with a vibrantly colored silicone jacket. The airtight twist cap and sturdy loop makes this a great alternative to plastic and metal bottles! My personal favorite tea pitcher is the Takeya Iced Tea Pitcher ($16.95) which holds 66 ounces of freshly brewed iced tea. It is stain proof, won’t become cloudy and is odor proof with a convenient airtight twist top lid. I normally use glass pitches but love this Japanese inspired design which is made of BPA free and food safe AcrGlass which is actually a safer plastic alternative that I can feel confident serving to my family. 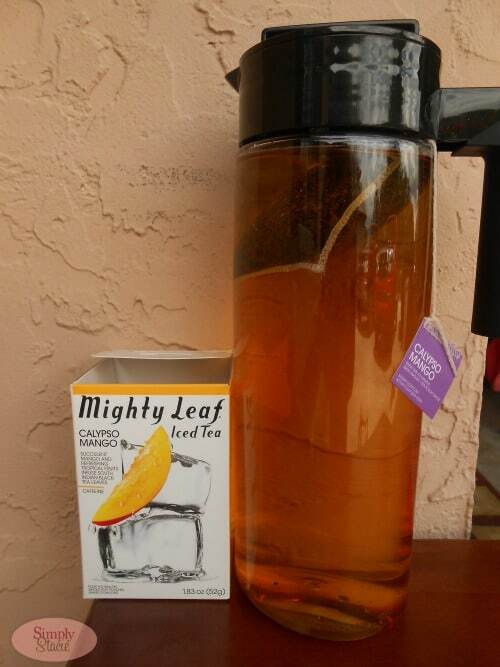 I love that Mighty Leaf Tea gives me the tea and accessories that I need in order to make freshly brewed, delicious tea easily which is a bonus for busy families like mine. You are invited to visit Mighty Leaf Tea to browse the entire selection of premium teas, blends and accessories. Coco Chai Rooibos will make a wonderful iced tea. I’d add a bit of coconut milk and sugar! I think the Island Breeze tea would make a great slush! Freeze the tea in ice cubes, stick through a good blender and it takes iced tea to a whole new level! I would love to try the Island Breeze tea in some type of tropical frozen cocktail. 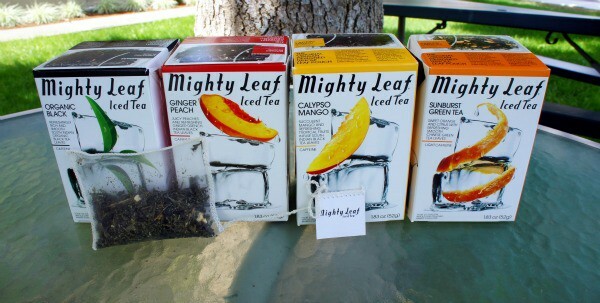 My favorite is peach iced tea and I would use the Ginger Peach Iced Tea bags from Mighty Leaf. I’d like to make the ginger peach fizz using the ginger peach tea. i love tea and I drink a lot of it. ice tea is my favorite. I would like to try the Pomegranate Berry green tea. I drink a lot of tea iced and hot, I like the organic black iced tea and the green ! I like the Crosswinds Cooler with the Island Breeze Iced Tea! The Organic Mint Melange is the one I think I’d brew the most! I don’t really have a certain recipe I use, but I would like to try the chamomile citrus tea of theirs, it sounds delicious. I would use the ginger peach tea and add a little more peach juice to it! any peach or raspberry tea would be fabulous…the ginger peach sounds fantastic! I’d like to make sun tea with the classic black. I love peach tea so the ginger peach would be amazing! I could use some now on this hot summer day! My family loves iced tea and that pitcher would fit perfectly in my fridge. Peach iced tea is a favorite of my family. I usually do a peach flavor tea and boil 2 qts water steep the tea for 5 minutes pour into gallon jar add water to the rest and lightly sweeten with sugar. I would try the ginger peach iced tea. I like a white ginger tea, so I would try the ginger peach. I like raspberry iced tea, but I’d really like to try the Gui Fei Oolong. I like Iced black tea straight. The Organic Black Tea sounds great. I just like a simple cup of hot ice using Gui Fei Oolong with a little bit of stevia. Yum! I’d just make some Calypso Mango and try to hang on to summer as long as I can. I love Iced Green Teas and would love to make one out of Marrakesh Mint! I love brewing fresh ginger then drinking the tea over ice with lemon and honey. I’d love to make iced tea with the ginger peach tea. i want to try the peach sweet tea recipe! I do not have a special tea recipe. but the Vanilla Bean tea from Mighty leaf tea. I like the green tea best!